The sweetest and tiniest 9 week old kitten who was crying outdoors late at night was reported to Carole, our L&F volunteer, in November 2018. Given the cold temperatures Penny was vulnerable and it was necessary on welfare grounds to take her into CP care. A new year homing for Penny, renamed Mittens, who went home with Ben, Sue and family on 03/01/19. 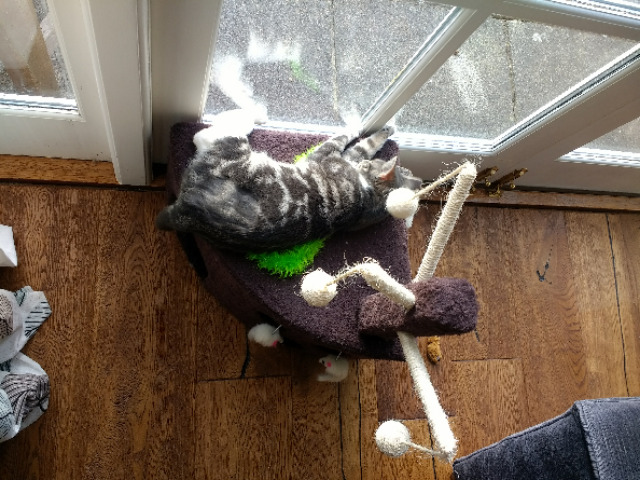 We've had a lovely update on Mittens on 16/01/19, owner Su says 'Mittens is doing well and I’m sure she has got bigger! In the pictures you will see a great cat toy / bed which Pinky kindly gave us – it’s great and Mittens loves it'."